Monday was recipe day chez Will. It began when I mentioned on Facebook that I was baking Russian Black Bread, and continued when Fritz suggested I send his maple syrup pie recipe to a new reader/commenter, The Queer Chef in Bergen, Norway (I’m glad he found me). Cream the butter, add the syrup slowly, then stir in all of the remaining ingredients. Pour into the pie shell; additional nut halves can be put on top. Bake at 375 degrees (we have an Aga cooker so we put it on the bottom of the baking oven) 40 to 45 minutes or until a knife inserted near the center comes out clean. Now, I never take any recipe at face value. There are already one or two small changes from the original in the above. I always add 1/4 cup coarse corn meal (adds a slight crunch to the crust) and 1/4 cup flax seed or flax meal for heart health. Depending on the recipe, I also add sunflower seeds, chopped walnuts, chopped dried apricots (very good in whole wheat breads), or chopped crystalized candied ginger (adjusting the amount of other sugar in the recipe if I do). I prefer baking with honey or maple syrup (again, REAL maple, not the flavored corn syrup kind) instead of refined sugar. I use a bread machine; or bake as you would normally bake bread. Opera companies in San Diego, Baltimore, Augusta GA, and the Berkshire Opera in western Massachusetts have all closed for good and I suspect there are others that have slipped away as well. The very important New York City Opera, founded by Mayor Fiorello la Guardia in the 1930s, is hanging by a thread. Mired in debt, prevented from performing this season by renovations to its home theater in Lincoln Center, and abandoned by its high profile, internationally known and connected new general manager Gerard Mortier before he had even taken over the job, City Opera’s Board canceled all existing singers'contracts and dismissed virtually the entire administrative staff in a move that’s going to make starting up again extremely difficult. A new general manager has been almost literally been stolen from the Dallas Opera. He will need all the skill, imagination and strength he possesses to dig NYCO out of the manifold crisis it’s fallen into. Theater companies are folding also. The renowned Theatre de la Jeune Lune in Minneapolis is perhaps the most high profile group so far. Other, smaller companies like Milwaukee Shakespeare and Santa Ana’s Rude Guerrilla Theater Company will be distinct losses to their communities. Boston Theater Works went out of business last year just about the time of the first hints of the enormity of the internal financial crisis. Bankrupted by mounting a highly praised, award-winning production of Angels in America, BTW cancelled its next two scheduled productions and then closed. A good friend of mine who is involved in the local Actors Equity organization, has been working with companies that need to renegotiate down the number of equity actors in each production they do in order to reduce costs as much as possible. Boston has also lost The Snappy Dance Theater. Inevitably, there’s going to be a lot more of this nationwide. Perhaps not surprisingly at this time of financial crisis in the performing arts, rabidly conservative Oklahoma Republican Senator Tom Coburn is introducing legislation that will block a single penny of any bail out money being used for any arts organization whatsoever—theater company, museum, symphony orchestra, dance troupe, opera company, you name it. The irony of the situation is that Coburn’s daughter Sarah is a well established operatic soprano almost certainly headed for a major career. While renowned artist Shepard Fairey was being feted around Boston in recent weeks, posing for pictures with Mayor Thomas M. Menino and preparing for his big opening night at the ICA, neighborhood groups around the city were seething. In the days leading up to Friday night's opening, Boston Detective Bill Kelley said, he was getting more and more complaints from residents of the Back Bay, the North End, and Mission Hill, furious that a man who admitted to spreading graffiti - even bragged about it - was being treated like a celebrity instead of a criminal. On Friday night, Kelley ended a stakeout by pulling Fairey's taxicab to the side of a Boston street and arresting him on an outstanding warrant on an old graffiti charge from 2000 as the artist was on his way to the Institute of Contemporary Art in South Boston. The arrest and its timing, combined with Fairey's rise from counterculture icon to mainstream celebrity, have exposed anew some of Boston's oldest contradictions - between convention and revolution, between propriety and creativity, between the old order of places like the Back Bay and the new-moneyed donors to the ICA. In its wake, it has left two unanswered questions: What is crime and what is art? "At the end of the day . . . he was arrested like any other graffiti vandal," Kelley said in a telephone interview. Fairey at 38 has become prominent for his "Hope" image of President Obama. As if Mr. Fairey doesn't have enough on his plate, the Associated Press has declared the photograph that was the basis for the artist's famous image to be copyright protected, and they want a piece of the financial action. Fairey and his lawyers will fight this claim on the basis that taking images and reworking them into different pieces of art is an activity with a long history that is protected and exempt from legal penalty. AP will no doubt counter that Mr Fairey is making big bucks from this image while the photographer hasn't even been given credit, much less a share of the profits. Scott of Bill in Exile put this poignant photo on his blog this morning along with this link to an Australian animal protection organization dedicated to saving koalas. The little marsupials (who are NOT bears of any kind despite their being commonly referred to as koala bears) are especially vulnerable to the horrendous fires blazing across southern Australia. Their normal habitat is trees, the last place any creature should be with the fires leaping rapidly from tree to tree. On the ground, koalas are slow and are suffering serious burns to their paws as they try to escape the flames. Like all of Australia's wild life caught in the inferno, they are suffering from dehydration. 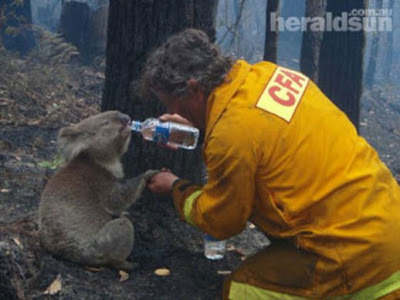 While they normally shy away from humans, the injured and desperate koalas are approaching firemen in hope of help--thus this picture that is becoming an icon internationally. Scott asked, and I am more than happy to spread his message, that you visit the site and give something if you can to help the association in its work to rescue and treat as many koala as possible. it is sad to hear of arts closing down. Sadder still to hear that people think the arts as something luxorious or incidental. we too are feeling the pinch - we are not going to renew or LOC tickets after a decade of going. We can't do the price what with our household cut down to 50%. i believe Steele came from the Dallas Opera not Houston. Thanks, E--I made the correction. It's bizarre that the Arts are suffering but (supposedly, anyway) gay bars are thriving. As for the Fairley thing, it's kinda weird. Of course, if it's technically law-breaking (as opposed to someone stretching the facts, like the Mooninite "bomb" scare), then it's hard to argue against. The pattern of society finding itself under financial stress and shifting its habits is interesting. Netflix and the previously endangered corner Mom and Pop video store are booming now that other forms of entertainment are above some budgets. Our attendance is actually up at the moment. We're attributing it to peoples' need to do something cheaper and closer to home rather than taking a long, expensive vacation. Unfortunately, the increased revenue due to visitation is paired with a really bad climate for philanthropy right now. How appropriate that my word verification is pankst. Will, we made your Maple Syrup Pecan Pie yesterday, and it was very, very nice! Thanks for sharing the recipe. Interesting story on Fairey, hadn't known about all that, but haven't been keeping up with the news very well lately. I'm certainly anxious to see what the fallout is from our 2K8 depression in my little niche of the design world. So far, none of our work in process has gone south, and new work has even come in in the last few weeks. The real test, I feel is where we'll all be in 2 or 3 years.